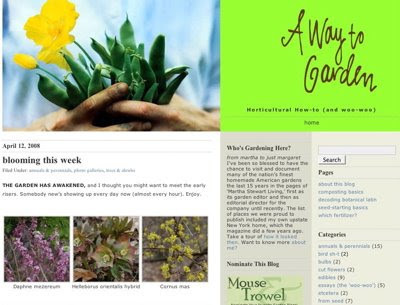 Thanks to Rural Intelligence for this heads up about Margaret Roach’s new blog, A Way to Garden, about gardening in the Hudson Valley/Berkshires Zone 5B. Margaret is the former editorial director of Martha Stewart Living and her blog looks like it will be a fantastic local resource. Thanks, Gina, for the nice words. Do come visit at Garden Conservancy Open Days (details on http://www.gardenconservancy.org of my open days and many around here). After all, we are neighbors.